Looking for a nice suburb where you have everything at hand, high standard of living, but still quick and easy access to Madrid ? You have to consider Pozuelo de Alarcon then, also known as just “Pozuelo”. If you live in Pozuelo, you do not need to go back to Madrid if you do not want. There you will find everything you need, from modern malls to a variety of services. It’s in fact the town with highest revenue per capita in Spain, just after Girona in Catalunya. Many Real Madrid footballers live in La Finca, the very exclusive gated community out of the centre of Pozuelo. The difference with other suburbs is its proximity with Madrid. 2 lines of Tramway (Metro ligero), 1 middle distance Train line (Cercanías), and half a dozen bus lines go through Pozuelo to Madrid, which means that you can be in the centre in less than 30 minutes. By car, it takes 25 minutes to get everywhere in Madrid. The most important criteria there, as always, is Location, and the proximity to public transport, the town centre of Pozuelo and the exclusive parts of the town. 1) The “Avenida de Europa”, the new centre of Pozuelo, also where the Tram (Metro Ligero goes) – highly recommended. 2) The train station of Pozuelo (Cercanías), also close to the old centre. To start with, if you have the right budget, we would recommend to live in the area between the station and the Avenida de Europa. This way, you can have the best of both words: shops & public transport close by, and the possibility to have space or even a house. 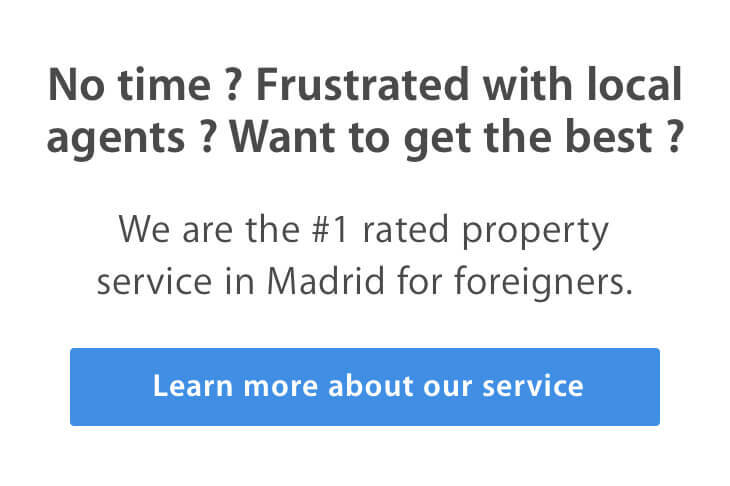 This brings us to the properties and prices you usually find in Pozuelo. 1) Apartments, usually within a community with swimming pool. The closer you are to the two reference points of the station and the Avenida de Europa, the less space you will get for your money. – Stand-alone house, either close to station or Avenida de Europa, or within the premium gated communities, 3000 – 4000 € / month. If your budget allows you to get what you want, go for Pozuelo. If you have more than 4000 €, I would recommend to consider also the neighborhoods with houses within Madrid : Mirasierra, Conde de Orgaz, Puerta de Hierro.